I have to admit that men are always difficult for me to buy for! My husband is especially difficult because he never says that he wants anything and he hates the attention of people buying things for him, although he is appreciative. Finding just the right gift to show him how much he means to me is hard, but it is something I am always on the look out for when it comes to birthdays, Christmas and Father's Day. With Father's Day coming soon, and because we have some awesome fathers and grandfathers in our family,(see the collage above), and knowing that you guys do as well, we decided that we would share some of our ideas for what we think would make awesome Father's Day's Gifts. We would sure love to hear some of your ideas as well because a nice list of men's gift ideas would be awesome! So, welcome to Friday Faves #62! Some of the dads in our family really enjoy electronics, from games to music gadgets. Here are some great ideas, Starting with the Echo Dot, or the Echo Second Generation with Alexa. There are so many uses for the Echo, but we love the music component and being able to hear a song as soon as you think of it! We wouldn't be 3 Winks if we didn't show you this awesome Owl Echo Holder! A little decorative for if your home decor is more traditional rather than modern. (This might be more for me than my husband). The Amazon Fire Stick with Alexa is another great choice! Some of our dads are definite meat eaters. Others do more plant based but do enjoy a good barbecue now and again. Here are some special splurges for those guys. Order some really good beef from Snake River Farms! If you order on May 29, use code feedmebrisket to get 20% off of your order. To go with those good cuts of meat, some nice savory rubs would be a good accompaniment. You can order these rubs for chicken, beef and pork on Etsy. You can order similar ones on Etsy. Just add your own names. 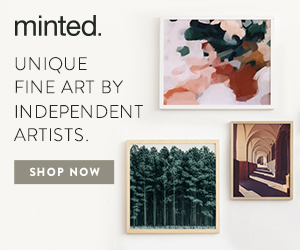 Minted makes these awesome photo collages in many sizes and shapes. I love the saying on this one. I think that my husband would love it as well. My husband wouldn't have a swimsuit if I didn't think to buy him one occasionally. Men aren't usually like women who think about these things. So, a number of years ago, when my husband was having a notable birthday, I bought him a new swimsuit and also tickets to the water park for his birthday. We went together, just the two of us, like we were kids again and had a great time. Right now Target is having a sale on swimsuits, so click on the photo to go there. If the water park isn't up your ally, the beach or Hawaii would also be great destinations to go with a new swim suit! This way of giving a destination gift would work with other types of clothing as well! A Star Wars Tee for the new movie, a Disney shirt for a Disney trip, shorts for a hike in the mountains or a camping trip, or a ski jacket for a ski trip! Whatever you think they would love. I love the idea of a destination gift, even without the clothing hint. Those are some of our favorite ideas! Please share yours because everyone needs all of the ideas that they can get when it comes to men's gifts! Leave your ideas in the comments, and have a great weekend!